It's hard to believe that 4.5 months have gone! Dayna says to stay until May 1, as the spring is very slow coming this year after the worst winter in recorded history in the Windsor/Detroit area. However, we have already put the wheels in motion, so to speak, so departure date is April 16. I finished another book two days ago, and when I entered my usual book summary in my Word document I keep on books I've read, I decided to count up just how many I'd read since we arrived here Dec. 1. Seventeen!! Here are most of them; two I gave to Goodwill as they weren't worth keeping, one was a neighbour's, And the Mountains Echoed, and that same neighbour has another, The Unlikely Pilgrimage of Harold Fry. I was pleasantly surprised. I also read several quilt magazines (love getting them secondhand at guild meetings for 25c and less) and browsed through two quilt books I bought. I'm well into Midnight in the Garden of Good and Evil, and really really enjoying it. I am going to keep a notebook handy from today's reading on, as he mentions so many places that I hope to see in Savannah next week. We are taking a different route this year, as well as a more relaxed pace to go home, staying first in Savannah. and then in Charleston. I am just SO EXCITED to see these two classic cities of the south. Today we spent a relaxing hour and a bit on Lido Key, soaking up some rays on that pristine chunk of beach on the Gulf of Mexico. Ahhh. The water was very refreshing, 71F, beautifully calm, and pale green. The beach was probably the most crowded we've seen, very unusual this late, we thought, especially since the dog beach was so vacant yesterday. We had a nice lunch out, nothing fancy, just our favourite local pub, Knick's Tavern & Grill. Yesterday was the dogs' turn: fun times retrieving tennis balls at the dog beach on Manatee Avenue. This is part of Palma Sola Bay. Rocco LOVES the water, but HATES sprinklers! See how narrow a strip is the beach and road? And how deserted! Since the dogs got their final showers and shampoo after their swim, I decided to do the same to Bella too. 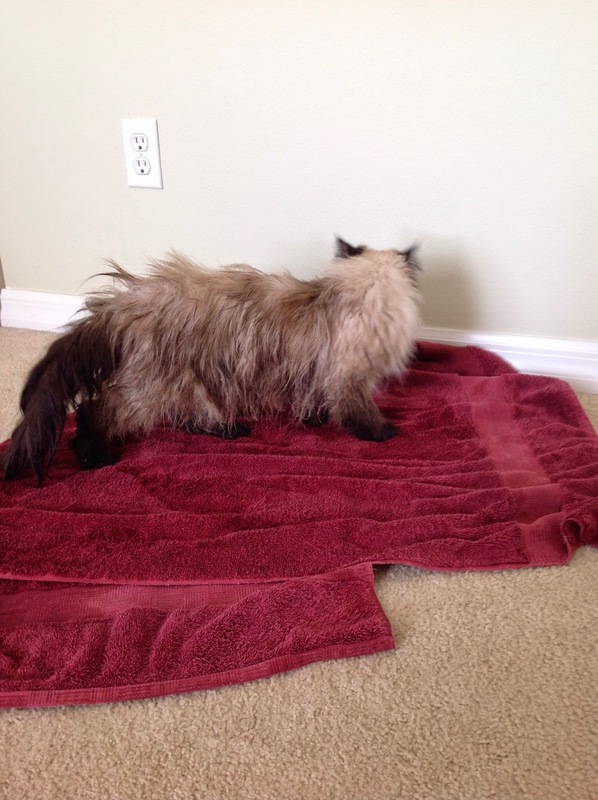 It was such a warm day, and she did toast herself in a chair on the lanai afterwards, licking her fur and glaring at me in indignation after subjecting her to that torment. She was NOT a happy camper, yowled so loudly for such a little girl, that both Rocco and Naala had to come to see who was hurting her! My final fabric purchases arrived today! Here is the rest of my little stash of solids from Christa Quilts! That link takes you to her blog, where you can find her new store and tons of great information. Five more Kona solids! They are only $5.57/yard right now and remember free shipping within the US. The bottom two are Amy Butler, and will grow up to become nesting fabric bowls aka "pails", a pattern I bought from Nova of www.acuppaandacatchup.com. I plan to line them with the olive. I have a modern slant Rail Fence quilt in mind for all my solids I collected from her this winter. And I bought some more of Lizzy House's "Pearl Bracelets". Remember my December 31 goals post? One of my goals is to do a modern take on one quilt from a few American Patchwork & Quilting magazines from the past. These are going to be perfect for the first one I've designed, from a 2005 magazine! This brings my total to 9 colours in this line! And Hawthorne Threads had a great deal on some fabric, $4.49/yard, so I think it will be great for the backing for Over and Under, even though it's a little more blue than green. They also had the pink chevron from Dear Stella fabrics on sale, so I think it will be a great binding for my Summer Daze quilt! Newly planted trees at the dog beach, brilliant orange flowers! These trees are fully in bloom everywhere and are just gorgeous. The squirrels chow down on them too! Our D. D. Blanchard magnolias are starting to bloom too, and I hope that the lower buds will open so I can inhale their intoxicating scent, said to be "nature's strongest sweet scent". The same magnolias that bloom in Essex County, but different from the D.D. Blanchard ones, are also here, and are nearly finished now. Sigh. I will miss the green, but I know I won't have long to wait. See how much you accomplished? Some of which you didn't even set out as goals - i.e. reading 17 books!! You really need to buckle down now on one goal - create your own quilting business. You ace everything else you set your mind to! Thanks so much for including the links to the trees - you maybe did that with me in mind, knowing I'd google them lol!! 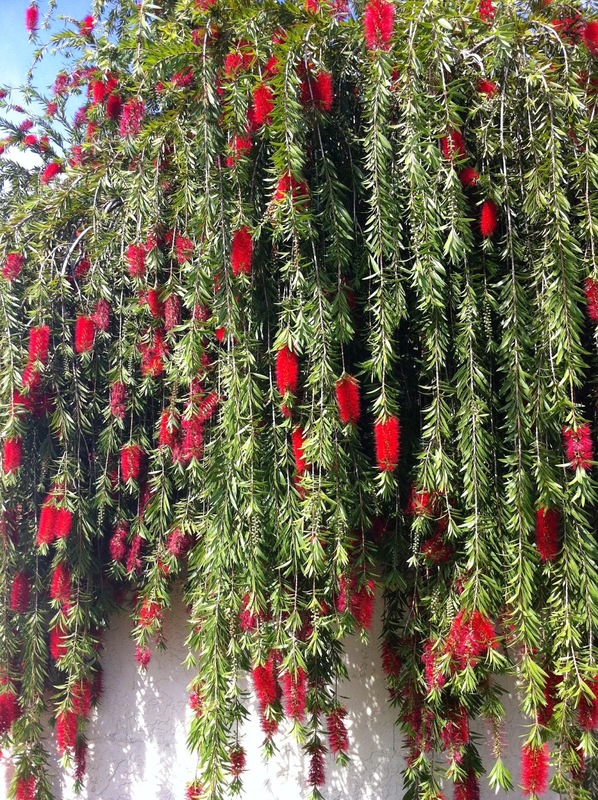 Wow, LOVE the bottlebrush, how whimsical! And one blossom of a magnolia can scent an entire house??!!! As you and Joe leave, Wednesday, Mum and W also leave - for Vancouver/Victoria! Can't wait for loads of pics on your road trip north!